This introduction presents the schedule, the tutorial presenters, and some background for the tutorial. Specifically, we briefly mention all the *OA terms that have been invented in recent years, such as SOA (Services), ROA (Resources), WOA (Web), SynOA (Syndication), and EOA (Event), and briefly set them into context. 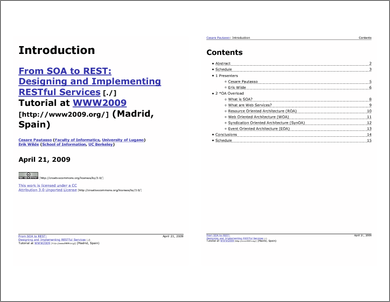 Our main goal is to explain our notion of SOA for the purpose of this tutorial, and what we perceive as the core tasks when moving from SOA to REST.